Thursday, May 9th at 7:30pm – Doors will open at 6:30 pm, and seating will begin at 7 pm. Friday, May 10th and Saturday, May 11th at 8pm – Doors will open at 7 pm and seating will begin at 7:30 pm. Find out more about the Withrow Sounds Again by clicking HERE. Buy reserved seat tickets now at Eventbrite by clicking HERE. Check out who’s coming by clicking HERE. PARKING: In addition to street parking, parking will be available behind the school near the new gym, and shuttle buses will be running before and after the show. Those who can’t get on a bus or otherwise need assistance may be dropped off in front of school, and assistance; including wheelchairs, will be available to help them into the school. 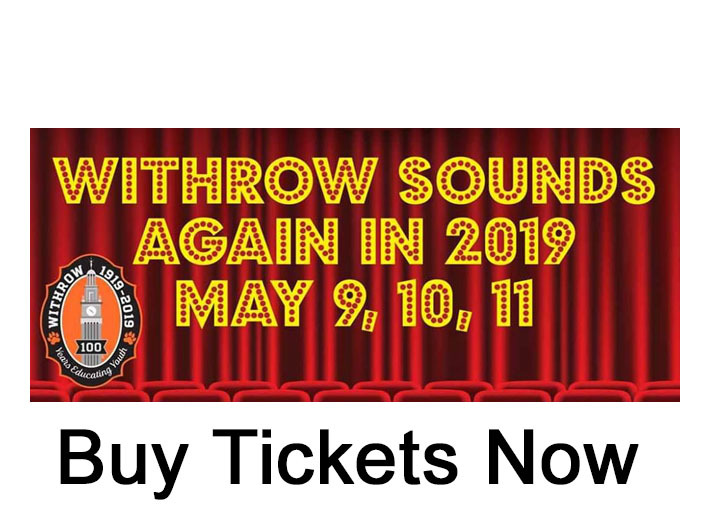 Support Withrow Sounds Again by purchasing Sounds spirit wear at the website Gift Mall. Tickets will also be sold in Withrow’s main hall every Tuesday and Friday from 11 am – 1 pm, every Thursday evening from 5 pm – 8 pm and on Saturday April 27th from Noon – 4 pm in the Gym lobby. To select reserved seating, tickets purchased at Withrow will be purchased through Eventbrite and will include a $2.85 processing fee per ticket. If selecting a reserved seat is not important, a ticket may be purchased at Withrow without the $2.85 processing fee; and a reserved seat will be automatically assigned. My name is Ronald Hairston of the class of ’69. I was in The Sounds from 1967 to 1969 and I remember those productions with great fondness. I would have loved to once again perform on that beautiful stage, but unfortunately I missed the audition information. I will nonetheless look forward to attending the show in May. ONWARD WITHROW! !